Home » Newsroom » Spoonville Dam is gone! Spoonville Dam is gone from Tariffville Gorge! Demolition of this derelict dam, breached since 1955, started on July 9. By July 31 the dam and its fragments were removed. Workers from Gleim Environmental Group, a dam removal company based in Pennsylvania, hammered the concrete structure into fragments that were trucked out of the river and recycled. 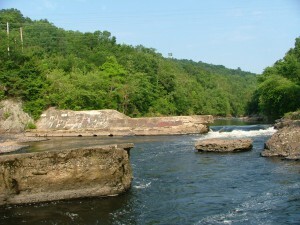 When the work was complete, the river channel had been restored to the bedrock ledge that the dam had been built upon. 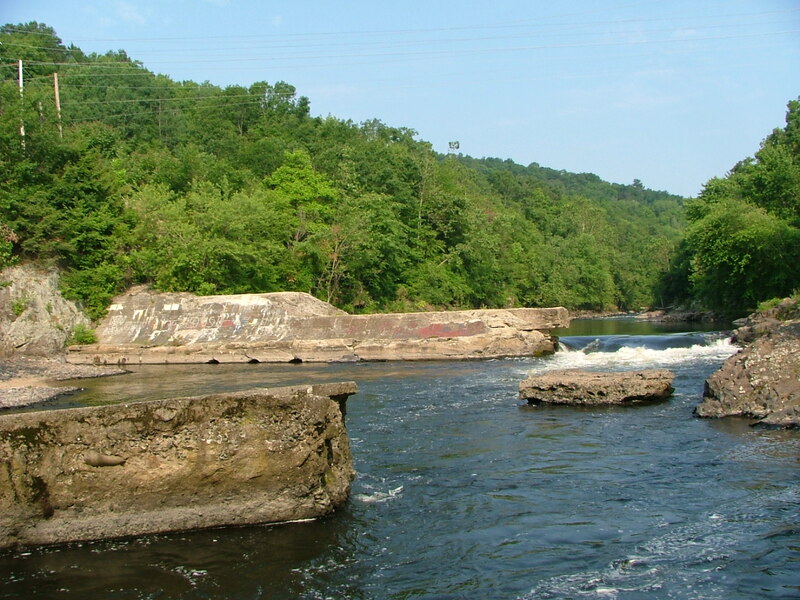 Rainbow Dam in Windsor, Winchell Smith Dam in Farmington, and the Collinsville Dams in Avon/Burlington/Canton. But removal of Spoonville dam is already beneficial, as it allows year-round resident fish species to travel upstream or downstream to find the best habitats.People benefit from the removal too, though whitewater paddlers miss the dramatic play feature provided by the breach in the dam. 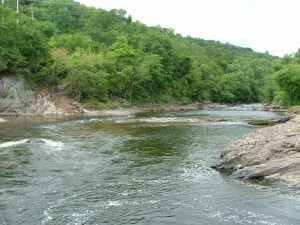 Swimming and boating in this part of the river are now safer, and the fishing should remain good! We extend hearty thanks to all our project partners, including Princeton Hydro Engineering, Gleim Environmental Group, CT DEEP, CL&P (the dam owners), and all the members of FRWA whose support makes work like this possible! This entry was posted in Newsroom, Our Wild & Scenic River by apetras. Bookmark the permalink.